Some reefs are strong sources of coral larvae. The Great Barrier Reef is better able to heal itself than we previously imagined, according to new research that identifies 112 individual reefs that can help drive the entire system towards recovery. The back-to-back bleaching events in 2016 and 2017 that killed many corals on the Great Barrier Reef have led many researchers to ask whether and how it can recover. Conventionally, we tend to focus on what controls recovery on individual reefs – for example, whether they are fouled by seaweed or sediments. But in our study, published in PLoS Biology, my colleagues and I stepped back to view the entire Great Barrier Reef as a whole entity and ask how it can potentially repair itself. We began by asking whether some reefs are exceptionally important for kick-starting widespread recovery after damage. To do this we set three criteria. First, we looked for reefs that are major sources of coral larvae – the ultimate source of recovery. Every year corals engage in one of nature’s greatest spectacles, their mass reproduction during a November full moon. Fertilised eggs (larvae) travel on ocean currents for days or weeks in search of a new home. With our partners at the CSIRO we’ve been able to model where these larvae go, and therefore the “connectivity” of the reef. By using this modelling (the Great Barrier Reef is far too large to observe this directly), we looked for reefs that strongly and consistently supply larvae to many other reefs. Healthy reefs supply far more larvae than damaged ones, so our second criterion was that reefs should have a relatively low risk of being impacted by coral bleaching. Using satellite records of sea temperature dating back to 1985, we identified reefs that have not yet experienced the kind of temperature that causes mass coral loss. That doesn’t mean these reefs will never experience bleaching, but it does mean they have a relatively good chance of surviving at least for the foreseeable future. Our final criterion was that reefs should supply coral larvae but not pests. Here we focused on the coral-eating crown-of-thorns starfish, whose larvae also travel on ocean currents. We know that outbreaks of these starfish tend to begin north of Cairns, and from that we can predict which reefs are most likely to become infested over time. Fortunately, many good sources of coral larvae are relatively safe from crown-of-thorns starfish, particularly those reefs that are far offshore and bathed in oceanic water from the Coral Sea rather than the currents that flow past Cairns. Indeed, the access to deep – and often cooling – ocean water helps moderate temperature extremes in these outer reefs, which also reduces the risk of bleaching in some areas. Using these three criteria, we pinpointed 112 reefs that are likely to be important in driving reef recovery for the wider system. They represent only 3% of the reefs of the Great Barrier Reef, but are so widely connected that their larvae can reach 47% of all the reefs within a single summer spawning season. Unfortunately, their distribution across the reef is patchy. Relatively few are in the north (see map) so this area is relatively vulnerable. Black dots show reefs identified as strong sources of coral larvae; grey dots show other reefs. Hock et al., PLoS Biol. Our study shows that reefs vary hugely, both in their exposure to damage and in their ability to contribute to the recovery of corals elsewhere. Where these patterns are pretty consistent over time – as is the case for the reefs we identified – it makes sense to factor this information into management planning. It would be sensible to improve surveillance of these particular reefs, to check that crown-of-thorns starfish do not reach them, and to eradicate the starfish if they do. To be clear, these are not the only reefs that should be managed. The Great Barrier Reef already has more than 30% of its area under protection from fishing, and many of its other individual reefs are important for tourism, fisheries and cultural benefits. But the point here is that some reefs are far more important for ecosystem recovery than others. Factoring these patterns into tactical management – such as how best to respond in the aftermath of a cyclone strike – is the next step. It’s a need that has been articulated repeatedly by the Great Barrier Reef Marine Park Authority. Taking the long-term view, the greatest threats to the reef are rising sea temperatures and ocean acidification caused by elevated carbon dioxide levels. This is clearly a challenge for humanity and one that requires consistent policies across governments. But local protection is vital in order to maintain the reef in the best state possible given the global environment. Actions include improvements to the quality of the water emerging from rivers, controlling crown-of-thorns starfish, and maintaining healthy fish populations. This is an expensive process and resources need to be deployed as effectively as possible. Our results help target management effectively by revealing the underlying mechanisms of repair on the reef. If management can help protect and facilitate corals’ natural processes of recovery, this might go a long way towards sustaining the Great Barrier Reef in an already challenging environment. Corals on the Great Barrier Reef have bleached again in 2017 as a result of extreme summer temperatures. It’s the fourth such event and the second in as many years, following earlier mass bleachings in 1998, 2002 and 2016. The consecutive bleaching in 2016 and 2017 is concerning for two reasons. First, the 12-month gap between the two events is far too short for any meaningful recovery on reefs that were affected in 2016. Second, last year’s bleaching was most severe in the northern section of the reef, from the Torres Strait to Port Douglas, whereas this year the most intense bleaching has occurred further south, between Cooktown and Townsville. The combined footprint of this unprecedented back-to-back bleaching now stretches along two-thirds of the length of the Great Barrier Reef. Last year, after the peak temperatures in March, 67% of the corals died along a 700km northern section of the reef – the single greatest loss of corals ever recorded on the reef. Further offshore and to the south, most of the bleached corals regained their colour after the 2016 bleaching, and survived. The patchiness of the bleaching means that there are still sections of the Great Barrier Reef that remain in good condition. It is still too early to tell how many corals will survive or die over the next few months in the central section as a result of this year’s bleaching. Each of the four bleaching events has a distinctive geographic pattern that can be explained by where the water was hottest for sustained periods during each summer. For example, the southern Great Barrier Reef escaped bleaching in both 2016 and 2017 because the summer sea temperatures there remained close to normal. Similarly, the earlier mass bleaching events in 1998 and 2002 were relatively moderate, because the elevated water temperatures experienced then were lower than those in 2017 and especially 2016. The marine heatwaves in 1998 and 2016 coincided with El Niño periods, but this was not the case in 2002 or this year, when water temperatures were also abnormally high. Increasingly around the tropics, we are seeing more and more bleaching events, regardless of the timing relative to the El Niño-La Niña cycle. This reflects the growing impact of global warming on these events. The local weather also plays an important role in determining where and when bleaching occurs. 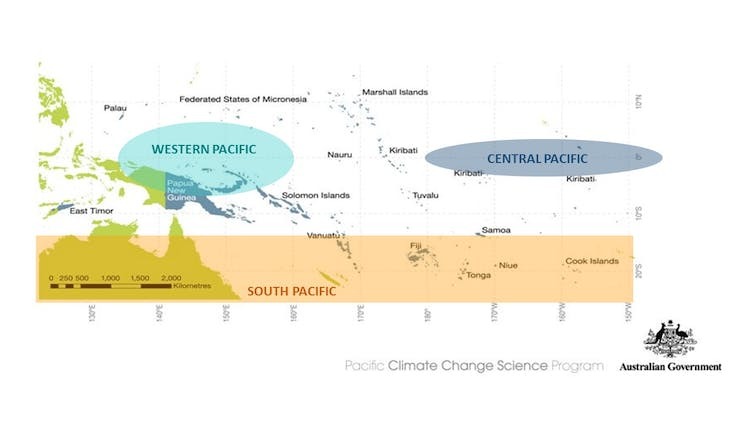 For example, in 2016, ex-Tropical Cyclone Winston came from Fiji to Australia at the end of February as a rain depression, and cooled the southern region of the Great Barrier Reef, saving it from bleaching. This year, the category 4 Tropical Cyclone Debbie tracked across the reef in late March, close to the southern boundary of the latest bleaching. But TC Debbie was too far south to prevent the bleaching that was already under way in the reef’s central and northern sections. Instead of helping to ameliorate the bleaching, this powerful cyclone has added to the pressures on some southern reefs by smashing corals and exacerbating coastal runoff. The fallout from this and last year’s events will continue to unfold in the coming months and years. It takes several months for severely bleached corals to regain their colour, or to die. On some reefs in the Great Barrier Reef’s central region, underwater surveys in 2017 are already documenting substantial loss of corals. The recovery times for northern and now central reefs that have lost many corals will be at least 10-15 years, assuming that conditions remain favourable for corals during that period. We have a narrowing window of opportunity to tackle global warming, and no time to lose in moving to zero net carbon emissions. We have already seen four major bleaching events on the Great Barrier Reef with just 1℃ of global average warming. The goals enshrined in the Paris climate agreement, which aims to hold global warming well below 2℃ and as close as possible to 1.5℃, will not be sufficient to restore the Great Barrier Reef to its former glory. But they should at least ensure that we continue to have a functioning coral reef system. In contrast, if the world continues its business-as-usual greenhouse emissions for several more decades, it will almost certainly spell the end of the Great Barrier Reef as we now know it.